Re: FIATY - Fiat S.p.A. So what you're telling me, Plan, is that I should look into Fiat. Damn, yet another potential investment to look into. I'm sick of all of these opportunities presenting themselves. LC, DCG and Sportgamma raised the idea. Though, since I spent the whole afternoon reading your good SHLD posts, I had to give back the favor. At a brief, impromptu news conference, Marchionne said Fiat has no need to tap the debt or equity markets to raise cash to purchase remaining Chrysler shares. Fiat owns 58.5 percent of the No. 3 U.S. automaker. While Fiat has ample cash on hand, he added, it could raise additional money if needed by selling assets, citing Magneti Marelli, which had revenue of 5.8 billion euros ($7.6 billion) last year, as an operation that could be sold. In the current weak economic environment, Marchionne said, "the availability of cash is crucial. It's better to be safe than sorry." Magneti Marelli employs about 35,000 people worldwide. The unit designs and produces automotive components including lighting, electronics, suspension and exhaust. "We've always taken the position that we would have to pay them, but the question is price," said Marchionne, speaking on the sidelines of a meeting of the Council for the United States and Italy, an international-relations group. The current arbitration proceedings, he added, are "part of the dance". If, as industry experts predict, the two sides cannot agree on a price by year-end, the trust fund can begin the process that would lead to an initial public offering of its shares, potentially depriving Fiat of its goal of gaining full ownership of Chrysler. However, the IPO process would take months to meet regulatory and other requirements, and a settlement could be reached during that time. UBS estimates the fair value of Chrysler at between $9 billion and $13.4 billion, meaning the trust fund's 41.5 percent stake is worth between $4.1 billion and $5.5 billion. Earlier this week, Fiat asked the Delaware court to make a ruling on a series of legal briefs instead of holding a trial, according to a court document seen by Reuters. The UAW's VEBA must reply to Fiat's arguments by Jan. 25, and Fiat will file its reply on Feb. 28. A judge is therefore unlikely to make a ruling on whether the case will go to trial until he has heard all the legal arguments from both sides, which won't be until March at the earliest. Fiat would be unlikely to move forward with raising cash to buy the remaining 41.5 percent stake before a judge rules on the price it must pay for the 16.4 percent. "As long as the pricing of the Chrysler option has not been confirmed it will likely take until late 2013 before the courts reach a decision on the VEBA trust action," Credit Suisse said in a note to clients today. "The bottom line is that no acquisition will be possible until then," it said. I will certainly read this thread when I have the chance. Thanks to you guys who posted on Fiat. You know, I went back and looked at some of my SHLD posts earlier today, and I couldn't help but chuckle when I came across Peter Burke CEO bashing me for my "grand elaborate plan" for SHLD and insisting that ESL buy back SHLD bonds. I liked a lot your views on the possible Lampert's masterplan. My worry is how to have some early indicators to be sure that is working, and not just fall on the fallacy: Lampert is a smart guy –> so he surely has a great plan –> therefore, he will succeed. That is what I've been thinking about. Maybe to follow where he is opening the SHOS stores and where they are closing closing mall stores and check if there is a match. Well, that is something to discuss on the SHLD thread. Posted in the board a while back. Chrysler Group LLC and Fiat SpA Chief Executive Sergio Marchionne said he will change Chrysler's board by month's end and said he could retire sometime after 2015. "There is going to be a guy after me, I guarantee you," he said. "Don't focus on the date, I would focus on the process." "This large management team, where we have 22 people representing nine nationalities, is designed to be a proving ground for people to sit and manage," he said. "It's more than likely my successor will come from that structure." Mr. Marchionne last week said he formed a Group Executive Council that will be responsible for running day-to-day business and for setting a unified, long-term strategy for Fiat and Chrysler. Until then, Mr. Marchionne had a team of about two dozen Chrysler executives reporting to him, and a similar situation at Fiat. Regarding China, auto makers there currently "produce almost entirely for the enormous domestic market, but their future plans for the export market are significant," he said. "Even assuming China were to export only 10% of what it produces, the risk we face in our home markets is enormous." Western auto makers "cannot afford to be unprepared for the ascent of China" and "need to continue to work to make our industrial base more competitive, because the day of reckoning is inevitably coming," he said. Western auto makers also can't count on dramatic growth in Asia to drive prosperity so must make their North American and European operations more competitive, he said. 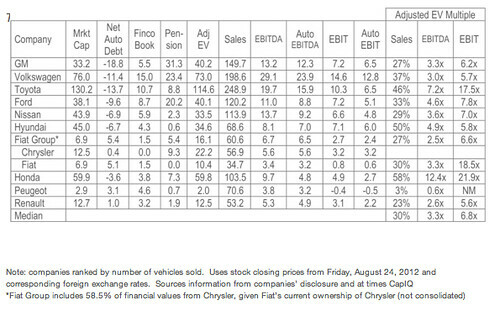 Fiat is an interesting enough stock and looks really cheap. However, the question really boils down to, can FIAT europe survive by it own ? I think this is the market 's major concern at this time. Fiat 's current strategy is to use the spare capacity in Italy to produce upscale models and then export. 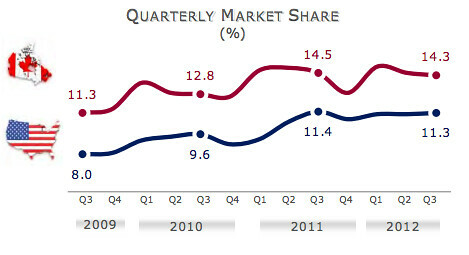 But many question if Fiat has powerful enough distribution channel and dealer network to sell sth like alfa romeo. 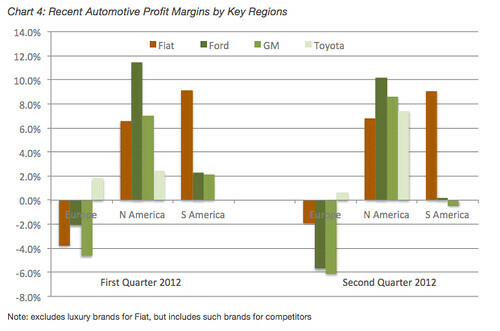 Also, Fiat is losing less than GM in Europe b/c it reduced its investment in new models. To improve Fiat's products and brands Altavilla can count on some magic from Olivier Francois, the energetic Frenchman who serves as Fiat-Chrysler's chief marketing officer, as well as Fiat brand's global boss. But Altavilla must also make some tough industrial decisions to tackle excess capacity Fiat's four Italian plants that currently run below 40 percent utilization. Here, there is little room for magic. Marchionne has promised the Italian government and unions that Fiat won't close any Italian vehicle assembly factories. The Cassino, Melfi, Mirafiori and Pomigliano plants have an installed capacity of about 1 million units, but are expected to build about 400,000 units this year. Marchionne's strategy is to build more upscale models in the factories and to boost exports from Italy to global markets. Building higher value Fiats Alfas as well as a new small Jeep in Italy will bring bigger margins that will offset the high costs of producing in the country. Analysts warn that Marchionne's plan is extremely challenging. UBS wrote in a note to investors: "Fiat did not quantify export targets, but we find it difficult to imagine more than 150,000 to 200,000 units a year at best. This means that Fiat will need to address capacity at some point in the near future." Barclays Capital said: "The majority of Fiat's competitors are pursuing the opposite strategy of trying to localize production wherever possible to hedge against currency risk." Barclays added: "Competitors have tried on numerous occasions but failed to push upscale, with the notable exception of Audi." Last but not least, Altavilla won't have the crucial Italian market on his side. Fiat still dominates Italy with a market share of about 30 percent, but the country's car sales have been plunging since a 2.5 million unit peak in 2007. Next year, new-car sales are expected to shrink to 1.3 million from a forecast 1.4 million this year.